Michael E. Arth is an American artist, builder, architectural and urban designer, and political scientist. In 2018, Arth became a declared Democratic candidate in the United States presidential election, 2020. On his campaign website, Arth states that he is a "reality-based" candidate who wants a social democratic system "that works for everyone." His issues include Universal Basic Income, Medicare for All, universal post-secondary education or retraining, and ending the War on Drugs (beginning with legalization of cannabis and any non-addictive entheogen). He proposes to end the two-party system, and the associated polarization, through a series of democratic reforms that includes Instant Runoff Voting for single member elections, Proportional Representation for Congress, campaign finance reform, staggered, 18-year term limits for the Supreme Court of the United States, and nullifying the Electoral College through a Constitutional Amendment, or with the National Popular Vote Interstate Compact. According to his web site, Arth was born on a United States Air Force base in England, where his father was serving as a noncommissioned officer, and both his parents were U.S. citizens. Michael E. Arth has worked with a wide range of media; from rock concert posters in the early 1970s, to original prints like etchings, serigraphs, and lithographs, to paintings, and photography. A large format book of his work, Michael E. Arth: Introspective 1972-1982, was published in 1983. He shifted focus in 1986 to home and urban design. In 2007, in collaboration with filmmaker Blake Wiers, he produced his first feature-length documentary. This was followed by two other feature documentaries in 2012. 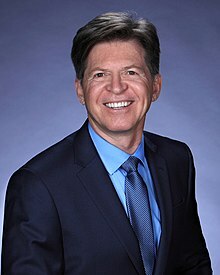 Gov'nor: A Man on a Bicycle, With no Money, Takes on the Fat Cats, Special Interests (and His Wife) to Run for Governor of Florida is about his run for governor. Out of the Woods: Life and Death in Dirty Dave's Homeless Camp follows the life and death struggles of homeless people living in a camp in the woods for four years. Arth directed, shot and edited Out of the Woods by himself. At least two more films are forthcoming, Midwives, and The Labors of Hercules: Modern Solutions to 12 Herculean Problems. Midwives follow Arth's two midwife sisters, one of whom was apprenticing under the other. The Labors of Hercules will compare the mythological labors of Hercules to 12 modern problems and offers solutions. Arth designed, built, and landscaped a small number of private residences in Southern California from 1986 to 2000, most notably "Casa de Lila," a seven-story Spanish style villa integrated into a mountain ridge in the Hollywood Hills. In 1999, Arth founded a more pedestrian and ecology-oriented version of New urbanism called New pedestrianism. His new approach calls for very compact new towns and neighborhoods where tree-shaded, pedestrian and bike lanes are in front of all residences and businesses, with tree-lined automobile streets at the rear. While the pedestrian lane idea is not entirely original (examples of rear loading garages with front sidewalks that replace streets were built in Venice, California, as early as 1910), his fervent emphasis on this as a panacea makes his work distinctive. Arth asserts that living in what he calls a pedestrian village, coupled with a compact, mixed-use neighborhood or village center, will ameliorate a wide range of problems related to urban living. Having such a development built near a downtown area or newly created village center reduces the amount of travel time that would normally be spent in an automobile, thus increasing the physical activity of the homeowner and saving energy. In more densely built new towns or developments, he claims that this new form of housing would greatly reduce the dependency on the automobile and the resulting village-like towns would vastly increase both aesthetics and quality of life. He also promotes the creation of similar pedestrian amenities that can be retrofitted to existing towns. Arth's design and development company, Pedestrian Villages Inc., develops projects that follow the principles of New pedestrianism. In 2000, while working on a book and documentary, The Labors of Hercules: Modern Solutions to 12 Herculean Problems, Arth found a small slum in DeLand, Florida, where he could try out some of his ideas. Subsequently, he purchased 32 dilapidated homes and businesses, which he restored over a seven-year period. Running out the drug dealers and rebuilding the downtown neighborhood won him the support of the community and a number of awards. He changed the name of "Crack Town" to Downtown DeLand's Historic Garden District. Arth enhanced the existing infrastructure by planting trees and by building pedestrian lanes, gardens, courtyards, and bike facilities in the district. New Urban Cowboy: Toward a New Pedestrianism, a feature-length documentary, was released in April 2008. The film chronicles Arth's rehabilitation of DeLand's Garden District and explains the philosophy behind New Pedestrianism. Democracy and the Common Wealth: Breaking the Stranglehold of the Special Interests is a wide-ranging, 480 page book published in 2010 that exposes what Arth calls the “dirty secrets” of America's electoral system. Arth proposes solutions to fix the electoral system, and then gives a long list of solutions to failed policies that could result from having a truly representative democracy led by effective, trustworthy leaders, who would be elected by a majority, and who would not have to spend their time raising campaign funds, or catering to paid lobbyists. It also tells the story of the first year of Florida's 2010 gubernatorial race. In the main text, and in the postscript, Arth writes about how he became an independent candidate for governor after being “frozen out” of the "undemocratic" Florida Democratic Party for not having millions of dollars, and for suggesting that campaigns be about issues instead of money. The first sixteen chapters are about how to break up the oligarchy and make "a more perfect union" that creates what Abraham Lincoln called a government "of the people, by the people, and for the people." To do this would require trading the winner-takes-all voting system for ranked choice voting in single member elections, and replacing single-member congressional districts for multi-member congressional districts, which would use proportional representation and a form of ranked choice voting called single transferable voting. It would also require doing away with private campaign financing, paid lobbyists, and most campaign advertising; and replacing influence-buying and propaganda with highly regulated public campaign financing that would cost a tiny fraction of what is spent now. "Pre-voting," by the electorate, with publicly financed micro-payments during the campaign, would determine both placement and ranking on the ballot in order to simplify the process and get voters more involved in thinking about the issues. He writes that the use of shared, electric, driverless cars, combined with the increased use of virtual reality for work, travel, and pleasure, could reduce the world's 1.5 billion cars to half a billion within a few decades. Arth believes it should be the aim of public policy for various environmental, safety, and economic reasons. Arth sees most of mankind's problems as being severely impacted by the 220,000 people being added to the planet every day. In 2015 the United Nations projected that, in this century, Africa would quadruple in population and that Asia would add another billion, while the developed countries would maintain zero or negative population growth. He proposes a "marketable birth-license plan" or birth credits that would protect both individual choice and the rights held in common to both allow people to have as many children as they want while still establishing sustainable population levels in all countries. Michael E. Arth shaking hands with supporter. 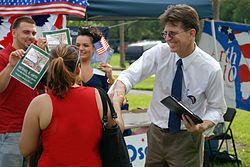 Arth began running for Florida Governor as a Democrat in June 2009. On the first day of the 2009 Democratic Conference, held in October 2009, Arth was prohibited from having an exhibit table. As a result of being frozen out of the Democratic Party, and believing that reform would have to come from outside the two-party system, Arth switched to independent status. His campaign emphasized the importance of radical transparency and better representation through voting rights reform. He disdained the private campaign financing system which he says elects fundraisers in the place of good leaders and marginalizes the issues. He wanted to do away with the winner-take-all voting scheme and replace it with Instant Runoff Voting and Proportional Representation. He called the War on Drugs "a war on the poor," and pointed out that Florida's incarceration is 8 times higher than Canada's. He said that Florida prisons are growing faster than any other state because of de-institutionalization of the mentally disabled, drug prohibition, and minimum sentencing laws. In late November 2009, the Orlando Sentinel reported that Arth would be taking his grassroots campaign on the road, and touring the state by bicycle beginning in Spring 2010. This was a nod to former Florida governor, Lawton Chiles, who walked the state of Florida in 1970 in successful pursuit of a U.S. Senate Seat. Regarding this trip, from Key West to Pensacola, he said, "There are always creative ways to get around the power elite, for justice and democracy to persist." Republican candidate Rick Scott won the gubernatorial election in a close election. As a result of switching from Democrat to Independent, Arth only received 18,644 votes, approximately 0.35% of the total cast in the general election. ^ "Michael E. Arth BIO". Retrieved April 22, 2019. ^ Arth, Michael E., Democracy and the Common Wealth: Breaking the Stranglehold of the Special Interests, Golden Apples Media, 2010, ISBN 978-0-912467-12-2. ^ Arth, Michael. "FEC Form 1". Federal Election Commission. Retrieved November 15, 2018. ^ Arth, Michael. "FEC Form 1". Federal Election Commission. Retrieved November 11, 2018. ^ Arth, Michael E. "Where I'm Coming From" (PDF). Michael E. Arth for President. p. 3. Retrieved 2019-01-14. ^ Michael E. Arth (1983). Michael E. Arth Introspective 1972-1982. Linnea Graphics. ISBN 0-912467-00-2. ^ a b c Light, Patti, Michael E. Arth: Local Filmmaker Brings Global Perspective, Floridian View, February 2013, pp. 32-35. ^ Barbara Thornburg, "Collectibles kick off a mix 'n' match decor," Los Angeles Times, October 8, 2008. ^ J.H. Crawford. CarFree Cities. International Books, Utrecht, Netherlands, 2000. ISBN 90-5727-037-4. ^ "Labors of Hercules". web.archive.org. 2009-02-21. Retrieved 2019-01-01. ^ Carolanne Griffith Roberts, "Saving a Neighborhood", Southern Living Magazine, April 2004, Florida Living pp. 22-25. ^ Arth, Michael E. "Golden Apples Media". Archived from the original on December 2, 2018. Retrieved January 1, 2019. ^ Arth, Michael E. (2010). Democracy and the Common Wealth: Breaking the Stranglehold of the Special Interests. Golden Apples Media, ISBN 978-0-912467-12-2. ^ "Rob Field, "Because We Can" Rants of Bob". Archived from the original on 2011-07-15. Retrieved 2009-10-30. ^ Ludmilla Lelis "Michael E. Arth: Dark Horse Candidate for Governor Has Eye on Reform," Orlando Sentinel. 11-24-09. Wikimedia Commons has media related to Michael E. Arth.